A million emotions were going through Matt Desch. He felt as if he were awaiting the arrival of a child. He was actually "birthing" 10 of his company's communication satellites into orbit, part of an eventual replacement of 66 satellites. "One of the most complicated technical feats in the aerospace industry," he said. A SpaceX Falcon 9 rocket carried the 10 Iridium satellites aloft Saturday. When the rocket was halfway around Earth and in the proper orbit, it sent Desch's "babies" off one by one, every 90 seconds, into space. They were to unfold their solar panels and reorient themselves with the stars and the horizon. 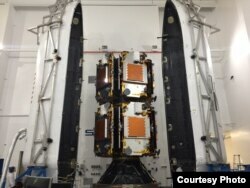 Desch said the 850-kilogram satellites, the size of a Mini Cooper, would start looking for antennas and begin communicating with Iridium's ground station in Norway, which will transmit the data to Virginia. And eventually, the payload on board the satellites could revolutionize how airplanes fly. "Today is a landmark moment in history for global air traffic surveillance, air traffic safety and the aviation industry as a whole,” said Don Thoma, CEO of Aireon, the company that developed the system inside the payload. "This successful first launch brings us one step closer to changing the way the world flies by enabling the ability to track aircraft anywhere on the planet." Over the next three months, the engineers will position the new satellites and perform a delicate choreography in a slot swap with the old satellites. The satellites travel at 27,000 kph. Each replacement must be completed while the satellites are moving, without any noticeable disruption to service. Sometime in 2018, all 66 satellites will have been exchanged for new, technologically improved versions. Currently, 70 percent of the world's airspace is without real-time surveillance because of rough terrain, deserts or vast oceans. The technology on the new satellites makes airplanes trackable over the entire Earth, including those black zones. No one can currently pinpoint a plane in those areas — even on a flight over the Atlantic from the United States to Europe — except the pilot and the passengers. "You look at the screen on the back of the seat and you see the map and you recognize where you are. But air traffic control [only] knows roughly where you are," Thoma said. The new technology is aimed at eliminating incidents like the aftermath of Malaysia Airlines Flight MH370. The plane disappeared over the ocean nearly three years ago while flying from Kuala Lumpur, Malaysia, to Beijing, China. The body of the plane and the remains of the 239 people on board have not been found, despite an extensive underwater search of the Indian Ocean. Only a piece of debris was discovered off Reunion Island. Prior to that in 2009, Air France 447 crashed into the Atlantic Ocean while flying from Rio de Janeiro to Paris. The flight recorders were not recovered until two years later. The more recent mystery surrounding MH370 prompted the industry to re-examine airplane tracking standards. 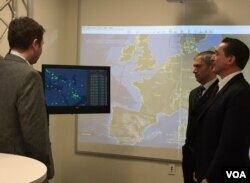 National and international aviation agencies have implemented rules and recommendations to make real-time tracking possible. Currently, U.S. pilots report their positions every 15 minutes. Internationally, pilots will be required to do that by the end of next year. A new rule, eased in by 2021 by the United Nations' International Civil Aviation Organization (ICAO), makes it mandatory for planes under distress to transmit a location report every minute. Airplanes will do this through a surveillance technology called automatic dependent surveillance-broadcast (ADS-B.) The ADS-B will transmit the plane's coordinates every minute to a receiver, like Aireon's system in the sky. The ADS-B equipment is not mandatory in all planes until 2020, two years after the receivers are operational. VOA asked about the delay during a media conference call with Federal Aviation Administrator Michael Huerta. He said the cost-benefit ratio was not justifiable, since the tracking system would benefit only "a small number of flights." But Aireon says the system affects thousands of flights daily and the industry as a whole, since airlines will be able to create more direct routes without avoiding traditional dead zones. Passengers will benefit from more efficient and more frequent flights. CEO Thoma says airlines will save millions of dollars in fuel costs, and the reduced fuel burn will cut carbon emissions, thus contributing less to global warming. Some new planes already are equipped with the technology and are awaiting 2018, when Iridium satellites begin their tracking. The Iridium satellite constellation is not the only group poised to implement the technology. Marco Caceres, a senior space analyst at the Fairfax Teal Group, an aerospace and defense firm, says Global Star also offers a lower-orbit satellite system, but Iridium's system is larger and will be the first of its size to be operational. "It may be that Iridium may be able to be the one of the early pioneers of this, but this is going to be the wave of the future for other satellite systems as well," Caceres said.